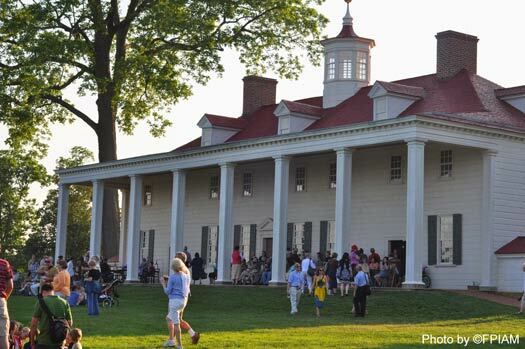 There is certainly plenty to keep you busy in D.C., but if you are driving to town and want a stop along the way here are a few of our favorite places to visit outside of D.C. 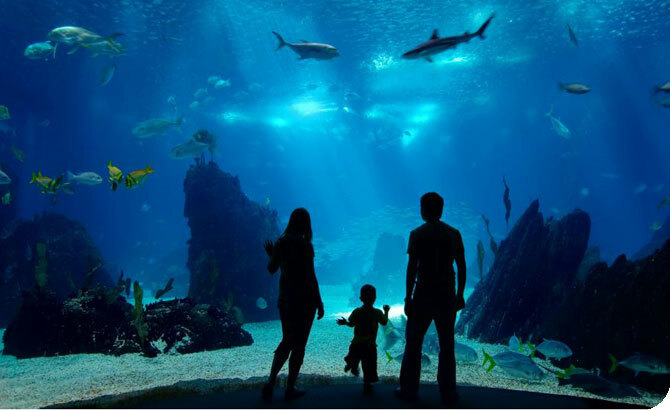 Dining: There are dining options within the aquarium, but there are also plenty of options around the aquarium in the inner harbor. Don’t miss the famous Maryland crab cakes, yum! MARC Train – If you don’t have a car, you can take the MARC train Penn Line that leaves from Union Station and stops in downtown Baltimore. Hours and Tickets: The museum is open 10:00 am – 5:30 pm every day except Christmas. May 25th – September 3rd there are extended hours and the museum stays open until 6:30 pm. Dining: Like the National Air and Space Museum on the National Mall, there is a McDonald’s located at this location as well. Getting there: The best way to get there is to drive. Parking is available for $15. Your other option is a cab which will cost about $60. As with all Smithsonian museums you will have to go through a metal detector. Only bottled water is allowed in the museum. This is where you will find the iconic Space Shuttle, along with dozens and dozens of other aircraft hanging from the ceiling, and parked throughout the hanger. 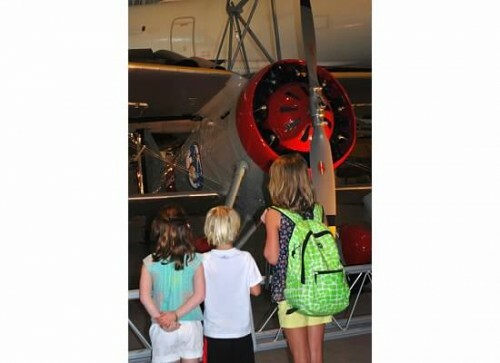 This is the place to see the big stuff like the “Spirit of Kitty Hawk,” the “Enola Gay” and the Stealth Fighter. I’m a girl and not really very interested in airplanes and space, but even I thought it was very cool. In addition to all of the planes, there are also flight simulators and 4D theaters. You can go to the top of the observation deck to watch the planes at Dulles take off and land. There are also family programs and interactive experiences on a regular basis so check the Calendar of Events before you go. Dining: The Bistro is open Monday–Friday: 11 am – 5:30 pm, Saturday: 9:30 am – 7:30 pm and Sunday: 11 am – 4:30 pm. Reservations are essential and can be made online. Getting there: The best way to get there is to drive. The store is located in a shopping mall so there is plenty of parking. Your other option is a cab which will cost about $30. It’s here, American Girl is at Tysons Corner. I will let you decide whether or not to share that information with your daughter, but if you decide to go bets are it will be the highlight of her trip. The store is located in the huge Tysons Corner Mall so there are plenty of additional shopping options to explore while you are there. The mall has a Macy’s, Bloomingdales, L.L. Bean, Restoration Hardware, Pottery Barn and H&M to name just a few. Visit the Tysons Corner website for a complete list. Tickets: Tickets can be purchased in person or online. Adults: $24.00, Children 6-12: $12.00 and Children 5 and under are free. Strollers are permitted, but I would’t recommend it. The pathways are narrow and there are areas where it would have to be carried up and down stairs. Location: About an hour and a half outside of DC: 101 Cave Hill Road, Luray, VA.
Getting there: The best way to get there is to drive. If you’re coming for a visit from the South stop on your way to or from DC and stretch your legs. 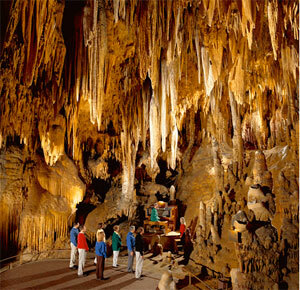 Located in the beautiful Shenandoah Valley this is an underground cavern with amazing views around every corner. The ticket price covers an hour long guided tour through the caverns with 11 stops along the way to view different rock formations. The ticket also includes an optional self guided tour through the car and carriage museum and the Luray Valley museum. I don’t know who loved the caverns more, me or my six year old daughter. It can only be described as super cool. And don’t forget to give the garden maze a go too. Visit the website for an aerial view and plan out your route! Hours are 9:00 a.m. – 5:00 p.m. Ticket prices: Adults – $13.00, Children 6- 11- $6.00 and Children 5 and under are free. Be sure to first stop at the Ford Orientation Center and pick up your family adventure map.